With Dynamics 365 Customer Engagement, start by opening the app for your role: Sales, Customer Service, Field Service or Project Service Automation. If you need to setup the product catalog or other management task, or if you’re an administrator, open Dynamics 365 – Custom to access functions in the Settings area. Sign in to Office 365, click the Office 365 app launcher, and then click the Dynamics 365 icon. The apps available to you in the app launcher depend on your subscription. In the Dynamics 365 Home page, select the Dynamics 365 app for your role. 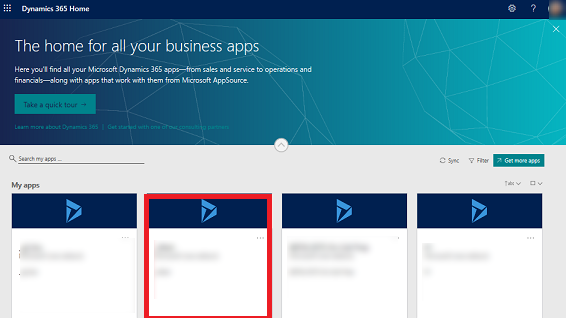 On the navigation bar, go to Dynamics 365>My apps, and then select the app you want. When you open an app, you’ll see tiles and icons (called a sitemap) for that app. Use the icons to access different types of information relevant to that role. The following illustrations describe the sitemaps for the Sales, Customer Service, and Dynamics 365 – Custom apps. Your Sales or Customer Service app sitemap may be different if your app has been customized. 1. Dashboards collect all your most important data in one place. You can select from several dashboards for your role. 2. Monitor real-time updates in What’s New on your dashboard. Stay current on fast-moving sales, customer projects, and marketing campaigns in your organization. 3. Keep track of tasks, email messages, appointments, phone calls, and more in Activities. 4. Keep track of companies you do business with in Accounts. 5. Store info about the people you work with in Contacts. 6. Use Leads to keep track of business prospects you haven’t yet qualified through your sales process. 7. Opportunities are leads who are almost ready to buy. 8. Track your Competitors so you know their strengths and weaknesses. 9. Most sales begin with Quotes, which eventually become orders. 10. Create Orders when your customers are ready to buy. 11. When customers place orders, create Invoices to bill them for the upcoming sales. 12. Products are the backbone of the business. Sales reps use the products list to generate sales quotes, marketing campaigns, orders, and invoices. 13. Access sales information for your team in Sales Literature. 14. Create Marketing Lists to run your marketing campaigns. 15. Use Quick Campaigns to send an email blast to customers who fit a specific demographic profile. 16. Use Goals to keep track of your progress on achieving target revenue. 17. Goals require Goal Metrics (a number or a dollar amount), which determine how goals are measured. 18. Use Rollup Queries to gather data about a given goal, including all its related goals, in one view. 19. Dynamics 365 comes with many built-in Reports. You can access and run them from here, or you can create your own reports. 20. Alerts shows system-wide alerts to let you know about issues such as problems with your mailbox. 21. The Calendar shows all your scheduled appointments. You can use rules when scheduling appointments. 2. Keep track of tasks, email messages, appointments, phone calls, and more in Activities. 3. Keep track of companies you do business with in Accounts. 4. Store info about the people you work with in Contacts. 5. Use Social Profiles to track a contact’s presence in social media. 6. Track your customer requests and issues in Cases. 7. Use the Service Calendar to view your organization’s daily, weekly, and monthly schedule of appointments and service activities. 8. Check Queues to see the cases waiting for you to work on. 9. View the list of your company’s Products when you’re working on customer service cases. 10. Tracks the specifics of Services provided by your business. 11. Dynamics 365 comes with many built-in Reports. You can access and run them from here, or you can create your own reports. 12. The Calendar shows all your scheduled appointments. You can use rules when scheduling appointments. 1. Use Business Management to set a variety of business settings. For example, set fiscal year settings, or when your business is closed. 2. Speed up the creation of articles, email, email signatures, documents, contracts, and mail-merges by creating Templates. 3. Manage products for your Product Catalog. This is also where you create discount and price lists, and set up unit groups for products. 4. Use Service Management to set up queues, routing rules, entitlements, service schedule, holiday schedule, and more. 5. Use Mobile Offline to enable mobile offline synchronization, enable entities for mobile offline, create profiles, and add users to a profile. 6. See Sync Errors associated with mobile offline. 7. Use Customizations to make Dynamics 365 work the way your business does: add or remove fields, create or customize forms, reports, views, dashboards, charts, and more. 8. It’s a best practice to keep your customizations separate from the default solution. Create and manage your Solutions here. 9. Go to the Dynamics Marketplace to find industry-specific apps on App Source. 10. The Plug-In Trace Log allows developers to use the iTracingService, and provides a way to see traces without requiring an error to occur to see the trace. Use this item to see a grid of all the Plug-in Trace Logs per plug-in execution. 11. Use Administration for a variety of tasks such as adding and removing support for languages. This is also where you can access the System Settings dialog box where you set a variety of different settings. 12. Use Security to add users and specify their security roles. You can also set up teams and business units. 13. Use Data Management to turn sample data on or off, import data, set up duplicate detection rules, and more. 14. Several Dynamics 365 features use System Jobs to perform tasks automatically, including workflows, import, and duplicate detection. Monitor your system jobs here. 15. Use Document Management to set up SharePoint integration. With SharePoint, your team can work together on the same documents. SharePoint integration is also required if you want to use other collaboration features like OneNote, OneDrive for Business, or Office 365 Groups with Dynamics 365. 16. Enable Auditing to track changes made to your business data. 17. Use Email Configuration to integrate Outlook or web mail systems with Dynamics 365. You can also manage and monitor mailboxes from here. 18. Users can stay up-to-date on what’s happening in your organization by using Activity Feeds. This is where you can administer them. But consider Yammer integration as an alternative to Activity Feeds. 19. Use Activity Feeds Rules to specify when posts will automatically be created for followed records. 20. Set up Dynamics 365 App for Outlook, which is an Office add-on for Microsoft Outlook. With Dynamics 365 App for Outlook, users can view Dynamics 365 data from Outlook, and can track Outlook email and appointment records with a single click. 21. Set up Relationship Insights to continuously analyze a vast collection of data to help users better understand business relationships, evaluate their activities in relation to previous successes, and choose the best path forward. 22. Use Processes to create business process flows, workflows, dialogs, and actions. 23. The Interactive Service Hub includes rich dashboards and forms that pull key information together for service workers so they can get things done faster. 24. Go to My apps to see the list of apps you can access. 1. Do a simple search for a record. 2. Get back to your pinned or most-recently-used records. 3. Add a new record. 4. Do an advanced search using filters, sorting, and criteria. 6. Get in-context help (guided tasks, videos, eBooks, and topics).